Dimiana Atanasova is Bulgarian by birth. 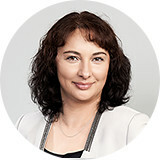 She studied social and economic sciences and has been working in Austria in HR consultingfor a number of years. At Iventa, she is responsible for the search for specialists and executives.